When installing lights in your home or purchasing electrical equipment, you need to be aware of what IP codes are and how they affect your product choices. IP stands for Ingress Protection and is formed with two numbers, shown in this format: IPXX. The two numbers refer to two separate levels of protection. The first number refers the level of protection against solid foreign objects, such as hands, tools, wires, or dust. 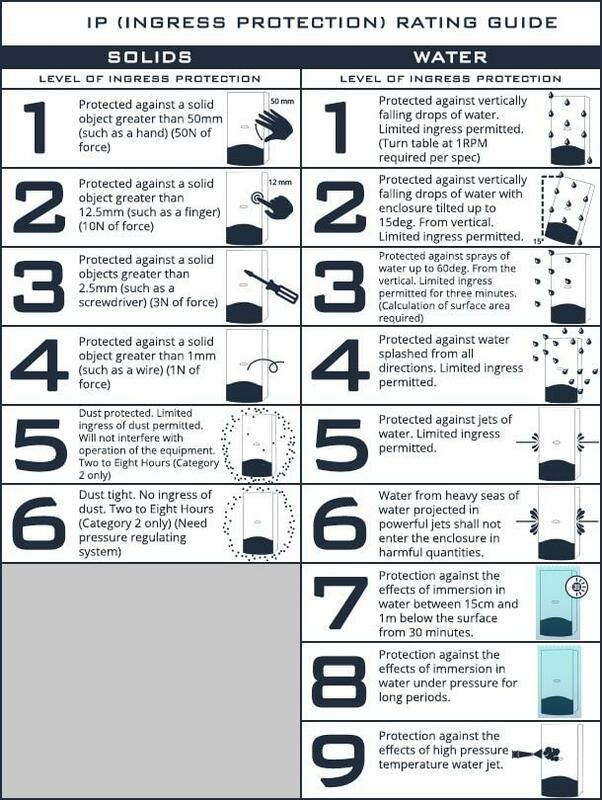 The second number refers to the level of protection against liquid, such as rain, hose pipes, or sea waves. If an ‘X’ is in place of one of the numbers, this means the IP rating only refers to the other number (e.g. IP2X would be solids only). IP codes are set by the IEC (International Electrotechnical Commission) and were designed to be a simple way of classifying the level of protection that the electrical item has. Different electrical items have different IP codes to show you where they are best suited for and what their limitations are, e.g. in direct contact with water or at risk of solid objects. More and more phones are increasing their IP ratings with each new release; the iPhone 7 currently carries an IP67 rating and the Samsung Galaxy S7 carries a IP68 rating. These high ratings are evidence of their above standard protection levels, for both dust and water. Lighting is still the most common item with IP ratings that you will come across. Every light has a different purpose in your home, for example, outdoor lights are better protected against exposure to both water and solid objects, while most indoor lights are only protected against solid objects. Their IP codes relate to their use and make sure you know where best to place them around your home.